Who Wants to Ride A Bicycle? Ready for a wild adventure on two wheels? Who hasn't dreamt of packing a bag and heading out onto the road? There's so much to explore out there! There are those little, weird roadside stops in the desert that sells taxidermied rodents alongside hand roasted pine nuts. Or you could go in a totally different direction. Rev it up and head into the mountains. You won't see a soul for miles. Camp next to a crystal clear lake and live on trout roasted over a fire. From trips to the beach or meeting with a leather jacket-clad club that's rassling up a little trouble, you're going to have a lot of fun. Just make sure you've got the right gear. 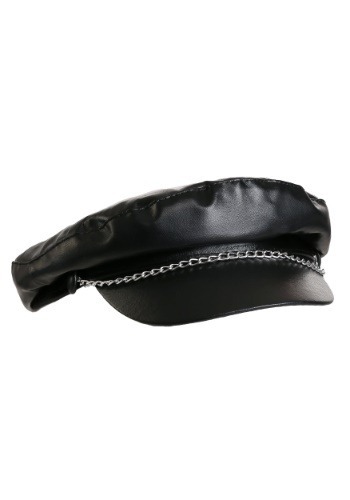 This faux leather cap will make you look like you're a tough, adventure loving biker. It's a little bit retro and it has a flat top. A chain crosses the curved bill to make your look complete. Now that you're ready for the bike ride of a lifetime, you just have to decide where to go. Pair this look with a leather jacket and motorcycle boots and the world is your oyster!